1- This wazifa help those, who doesn't have sustenance, and worried to get a proper job or business. So read Bismil-lah once then 3 times Sorah-e- Alam Nashrah, 41 times Sorah-e-Qadr and 1 time Sorah-e-Waqia. Insha-Allah Allah will create the ways to get job or Proper sustenance. 2- Reciting Sorah-E-Muzammil is very effective for jobless or any other wish. For any kind of relieve read Sorah-e-Muzammil after Namaz-e-Fajar like our way. Start reading Sorah-e-Muzammil when reach at ayat-9 ( Rub-bul Mashriqe wal maghribi ...... Fat-takhiz hu Waqilaa ) so read this ayat 3 time, after that read ( Wal-laho Yoqad-dirul-layla wan-nahar ) 3 times, read ( Min Fazlil-lah ) 3 times, read ( Wastagh-fir-Ullaha In-nal-laha Ghafoor-ur-Raheem ) 3 times and then complete the Surah-e-Muzammil as it is. After completing the surah please pray for your sustenance, job, Barkat / blessing in business etc. Within few days or after 7 days Allah will arrange source t fulfill your wish. If you have any other desire instead of Rizq then while praying call the name of your wish. Note: at one time do this wazifa for only one wish, After the completion of one wish start again surah-e-muzammil recitation for another desire. 3- Reading " Ya Raz-zaqoo" according to its numbers 319 times after namaz-e-Isha or morning prayer is very favorable for the person's job, and business. The person who recite this ism never feel Distress, hardship in sustenance, and the person who is already suffering from shortage of sustenance should read the Ism Ya razzaqoo to get rid the problem. 4- When new moon appears and first Thursday will come of new moon then read " Surah-e-Waz-Zuha" after sun rise 1,000 times, do same after namaz-e-Maghrib that read1,000 times after Maghreb prayer after 40 days write surah-e-waz-zuha and aslo write the line that " Allah please mercy upon me, bless me and expand my sustenance " after writing this line fold the paper once and keep it where you put your money like wallet or safe. Insh-Allah due to blessing of Allah and this ayat you never feel shortage in your money. you can do the same process over salt like read surah-e-wazzuha 40 times and blow upon salt and add that salt in food then you never feel any disease as well shortage of food. 5- On the first of Rajab month or 27th of ramadan-ul-kareem write this ayat on paper and put in sauser and after recite ism " Ya Kareemoo, and Ya Raz-zaqoo " 1,000 times and blow inside the saucer after that cover the saucer with flour dough or wax and put this saucer in godown where you put the grain. ( Bis-mil-lah Er-rehman er-raheem Mis-lul lazeena yun-fi-qoona Amwa-la-hum Fi Sabeel-Allah-e Ka-ma-sil Hab-behee Am-ba-tat Sabaa Sana-bilaa fi Qul-lihi Sunbulo-ho fa-innahoo Hab-be-hey Wal-lahoo Yuz-aafoo Liman yashaaoo Wal-laho Wasiyoo Aleemoo wa-Aaya-ta Minkaa Warzuqna Wa-anta Kherur -Razeeqeen ). 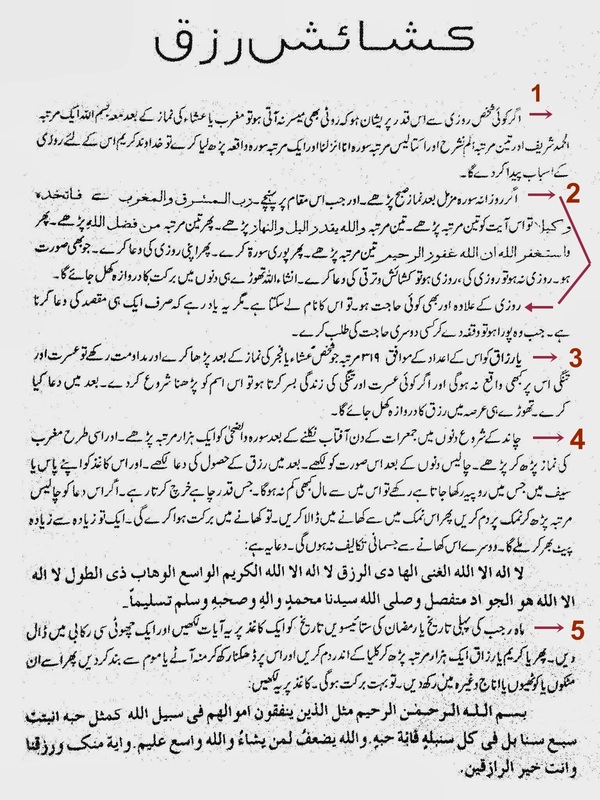 it is a easy wazifa but It doesn't make cleare in the end of number 2 wazifa regarding surah-e-Muzammil how it needs to finish, after reading accordingly with 4 verses three times repeat and finish it , after that should we read it once without repeating three times those verses or not.